Lloyd Kaufman and “Guardians of the Galaxy” Director James Gunn! This summer, Lloyd Kaufman, President of Troma Entertainment and creator of the Toxic Avenger, made a memorable cameo appearance as an interstellar prisoner in the Marvel Hollywood blockbuster Guardians of the Galaxy! 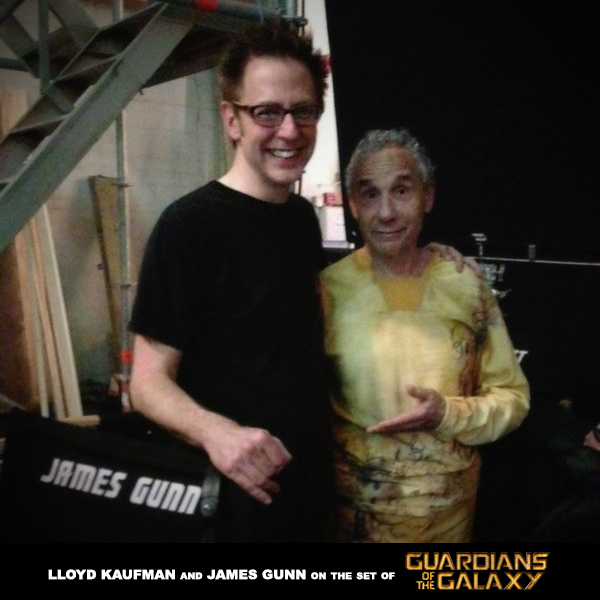 Seen here posing with Guardians director James Gunn, Kaufman’s cameo continues a long history of collaboration between the two filmmakers. Nearly twenty years ago in 1995, Gunn and Kaufman teamed up to write the now-classic Tromeo and Juliet, a “no-holds bard’ adaptation of the Shakespeare play. Gunn went on to direct the creature feature ‘Slither’ (2006) and the darkly comedic ‘Super’ (2010) before signing on director of this latest film. Not one to forget a friend, Lloyd graced the Guardians of the Galaxy set back in July of 2013 for what turned out to be one of the summers biggest box office smashes! This entry was posted on Wednesday, October 15th, 2014 at 4:06 pm	and is filed under News. You can follow any responses to this entry through the RSS 2.0 feed. You can leave a response, or trackback from your own site. You are here : Home » news » 2014 » 10 » 15 » Lloyd Kaufman and “Guardians of the Galaxy” Director James Gunn!